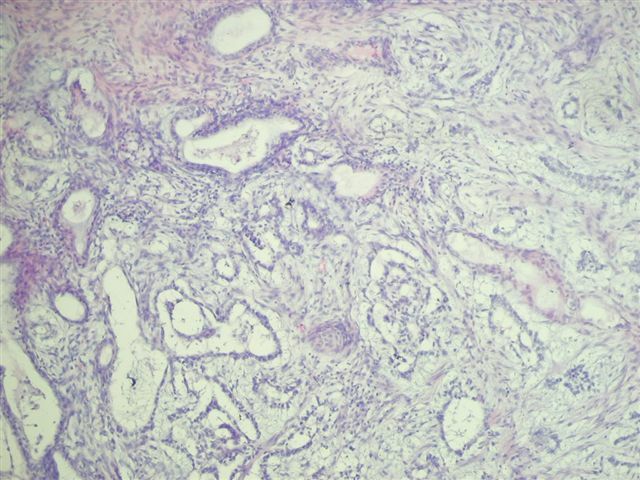 A 29 year old man had a left testicular mass, which was excised. 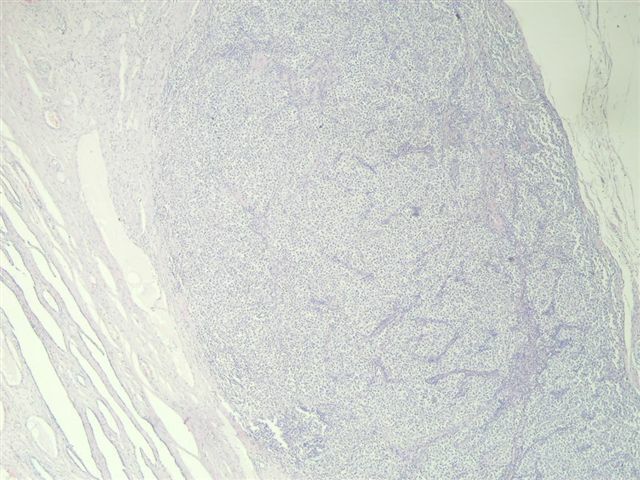 Gross description:� Most of the testis was replaced by a 5.9 cm gray-white mass with focal hemorrhage that was adjacent to the tunica albuginea.� There was only a small peripheral rim of normal appearing testicular tissue.� The spermatic cord was unremarkable. 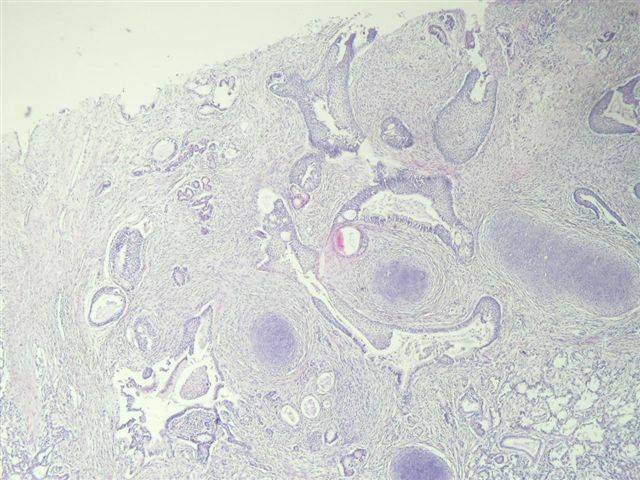 Most testicular tumors are mixed, and for prognostic purposes, it is important to list the components present and to estimate their percentage involvement.� Figure 1 and figure 2 illustrate the seminomatous component.� Tumor cells are polyhedral, with clear cytoplasm and central large nuclei, that upon higher magnification, have prominent nucleoli.� Seminoma cells are PAS positive and immunoreactive for PLAP.� The stroma contains a prominent lymphocytic infiltrate.� Figure 3 and figure 4 demonstrate the yolk sac component, which is frequently missed by pathologists who do not look for it specifically.� Yolk sac tumors have numerous patterns.� The classic pattern has numerous Schiller-Duval bodies, composed of a central capillary surrounded by visceral and parietal layers of glomeruloid-type cells (image).� The alpha-fetoprotein immunostain (image) may be helpful in identifying or confirming a yolk sac component, although embryonal carcinomas, teratocarcinomas and other tumors may also be AFP positive.� Finally, this tumor had a prominent immature teratoma component (figure 5, figure 6, figure 7). 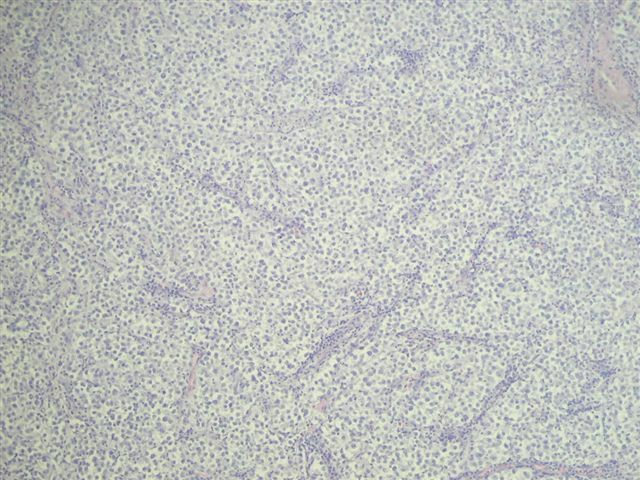 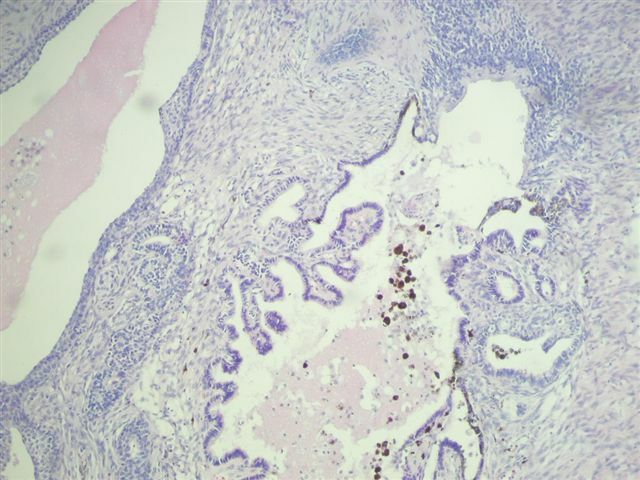 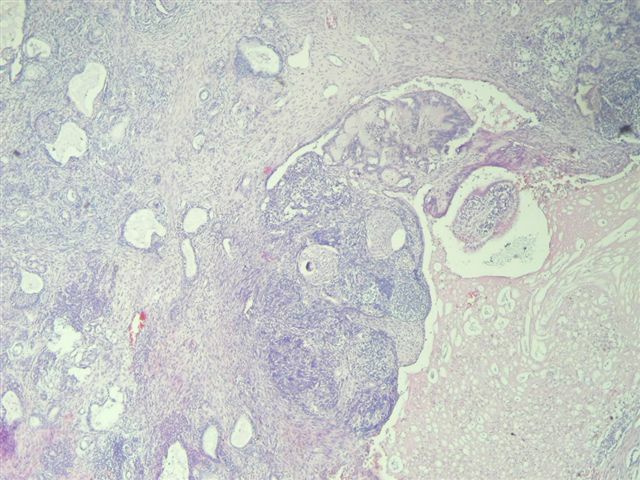 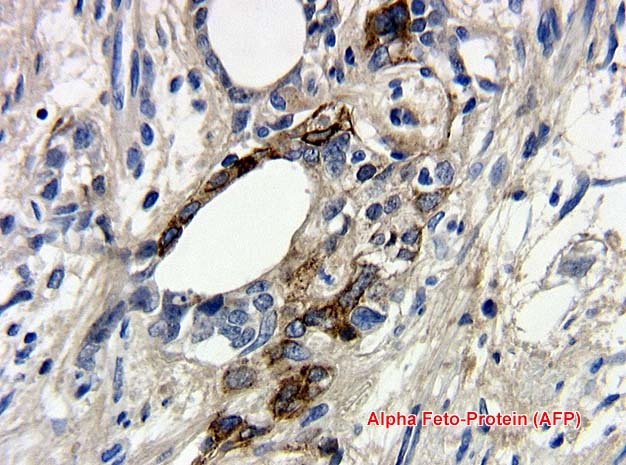 �The tumor had neurectodermal structures with retinal-like elements, immature cartilage and blastema-like elements resembling Wilm�s tumor.� Immature teratoma elements are often graded as high or low grade, although the prognostic significance of this grading is not well established.� High grade tumors are highly cellular with mitotically active, immature elements. 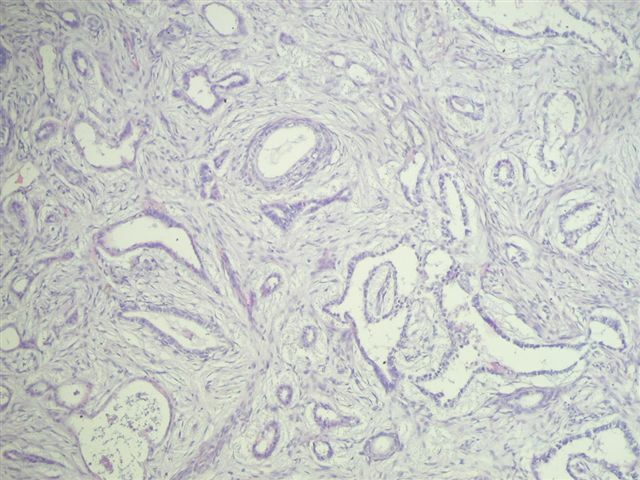 The list of required elements to report for testicular tumors, as well as current staging systems, is available from the College of American Pathologist�s web site (click here).